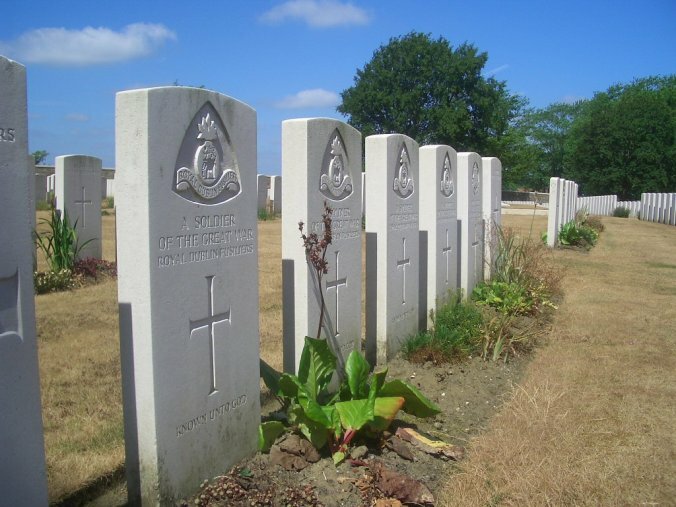 Royal Dublin Fusiliers | A site dedicated to memory of those who served with the Dubs. It is the internet's most frequently visited RDF on-line repository. The Royal Dublin Fusiliers website promotes the memory of the Irish soldiers who served with the Royal Dublin Fusiliers in the 16th Irish Division in the First World War (WW1) Great War, and features military medals won by them and the campaigns in which they fought. The Royal Dublin Fusiliers was an infantry regiment of the British Army. The regiment was created on 1 July 1881 by the amalgamation of the 102nd Regiment of Foot (Royal Madras Fusiliers) and the 103rd Regiment of Foot (Royal Bombay Fusiliers) to form the 1st and 2nd Battalions, The Royal Dublin Fusiliers. Before Irish independence in 1922, it was decided that the six southern Irish regiments (out of a total of thirteen Irish regiments) would be disbanded, including the Royal Dublin Fusiliers. This site is to honour the men who served this regiment.